We all know about Caterpillar and their reputation for making the best products for workmen. From construction equipment to toys and scale models to nifty pocket knives to phone cases and clothes. These guys are serious about their work, and their work is to make stuff that you can take into the harshest kind of work environment. You take it in, you take it through, and it comes out the other side as fine as it was going in. 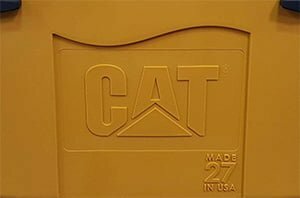 In fact, they’re so good at their job that the brand ‘Caterpillar’ has become synonymous with ‘rugged’. That’s all fine and dandy but we certainly had no idea they were in the cooler business. We know about their construction equipment, their shoes, their gear, and their great to-scale models. When we found out about their hard coolers, we were curious. Will they stay faithful to Caterpillar’s rugged reputation, or will they fall short? Come to think of it, it makes some sense that we should have a Cat cooler. After all, they try to make gear that makes life easier for someone who’s constantly on site in a harsh work environment. Why not also make sure they have somewhere to store their food and drinks? Needless to say, what we found was quite exciting. I’m tempted to end this post right here and say that everything was fine and dandy and you should go buy yourself a Cat cooler right now. But of course, I know you’re always interested in the details, just like us. So buckle up and get ready for the ride! Below is a lineup table of Caterpillar Cat coolers, showing their various features and differences. The prices are also featured. 34-1/4” x 17” x 19"
Caterpillar is synonymous with ruggedness and toughness. That said we had some seriously high and lofty expectations for the design and construction of this cooler going in, and we weren’t disappointed. This isn’t your average roto-molded cooler. It is injected with polypropylene. Most roto-molded coolers (like these here) out there are made out of polyethylene. There’s nothing wrong with that, we’re not trashing it. What we’re saying is that polypropylene is a far superior material. 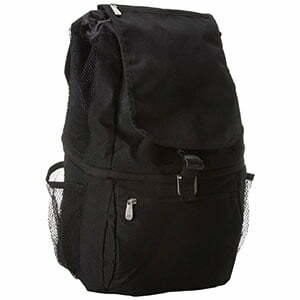 It is far more resistant to UV radiation, for example, and won’t scratch or damage easily. It is also very thick, aiding the insulation of the cooler (R-5 thermal resistance value). As it turns out, it’s perfectly safe as it is approved for contact with food by the FDA. One thing I really loved seeing was the CAT logo on the cooler. It’s right there, recognizable as ever. 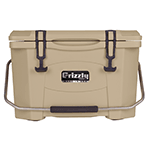 It’s molded pretty well into the side of the cooler and helps to give it the rugged look we have all come to love. The Caterpillar cooler isn’t the bells and whistles kind of cooler you may be used to. We’ve looked at coolers like Yeti and Icon before, and we couldn’t stop gushing over all the extra bells and whistles they had. With the Caterpillar, it’s all about achieving the bare minimum. Everything is absolutely purposeful. When they made this cooler, they weren’t thinking of someone who would want to show it off to friends for how feature rich it was; they made it for people who wanted something that could withstand just about anything. We believe they did a fairly good job at this. 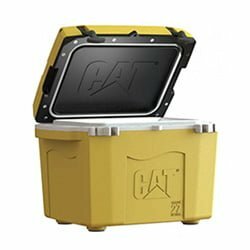 There are two hard coolers offered by Caterpillar: the 27 quart one and the 55 quart one. We’re going to look at the 27-quart cooler here, but most features are the same at 55qt option. Let’s start with the lid. When I look at it, I can’t help but think of a caterpillar truck engine. It even has those signature holes in the gasket where they fit in all the bolts. 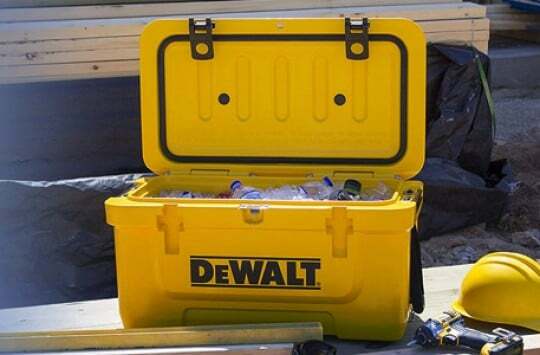 That characteristic yellow color on the entire cooler certainly helps with the imagination. As for the gasket itself, it’s a single piece and is coupled with a rigid foam barrier to help seal the lid. Once you firmly secure the lid on this cooler, you can be sure there’s no heat going in and no cold going out (okay, I know the bit about cold going out doesn’t make sense scientifically but hey, let me have my fun). The lid itself is secured by rubber T-rex latches. 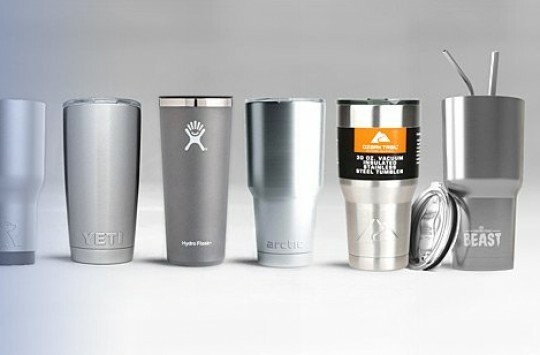 T-rex latches are pretty common in the cooler industry, most popularly being seen on Yeti and Rtic coolers. That doesn’t mean that all T-rex latches are of the same quality, however. Some of them are made of cheap plastic and will shatter the first chance they get. Others are made of rubber but are way too floppy. That means they easily come unlatched. You could close the lid and secure it firmly with the latches, then put the cooler in the back of your car and go for a long journey on rugged terrain. About 2 hours later you go to the back and check on your cooler and there it is: it opened somewhere along the way and spilled its guts all over the back of the car. If that isn’t the most annoying thing ever then I don’t know what is. The lid on the Cat cooler has firm latches that don’t easily come undone. You can put them in the back of your car and have peace of mind. But what if you still feel iffy about it? What if you still want some kind of reassurance that your lid won’t fly open when you hit the mother of all speed bumps or when your car literally drops into the father of all potholes? Don’t worry, the manufacturers have got you back. There are lock holes in the lid where you can fit padlocks. Aren’t they just thoughtful! There’s another problem I have with many coolers. When you open it, you have to hold the lid up while you rummage through the cooler for whatever it is you were looking for. Now, I don’t know about you, but I like to use both of my hands when I’m looking for stuff in my cooler. That way I’m likely to find it faster. Caterpillar understands this. They fashioned the hinge of the lid on their Cat cooler out of an aluminum rod. The lid will hold its position when you open it and you don’t have to hold it up as you do your business in the cooler. We love the handles on this cooler. They are slim and molded into the cooler. Oh, wait, that’s just one set of handles. 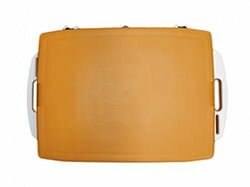 You can hold the cooler up by the molded handles, which are very ergonomically sound, by the way, or you can use nylon handles fitted into the sides. We were quite proud of this cooler for having two handles on either side, rather than a single one. It’s always easier and more practical to carry a cooler when it has two side handles. The ice chest itself is well built but with no accessories. It has plenty of space for your drinks so you can crack a cold one with the boys after work. To put it simply, the ice retention on the Cat cooler is good enough. It will easily last several days, 6-7 days at the maximum. Caterpillar didn’t mention anything about the ice retention capabilities, only saying that it was good, so we decided to test it ourselves. We put our drinks in the cooler on a Friday (as usual), and waited it out. By Monday the ice was still there. We noticed the first signs of melting on Wednesday and full water by late Thursday of the next week. In our book, that is good ice retention. You also have to be considerate of the fact that this cooler wasn’t exactly built for long hikes into the woods or camping; it was built for the working man to keep his drinks cold. For that purpose, we think the ice retention is actually too good. TIP: To maximize ice retention you may want to use ice packs along with the ice. Here are some great ice packs we recommend. The 27 quart one can easily pack 24 cans plus ice. The 55-quart cooler is large enough to fit 60 cans and plenty of ice. As for colors, they all come in Caterpillar’s signature yellow. 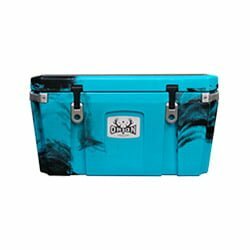 If you want something different you’d have to go for their Big Buck cooler, which comes in camo and white options. But that’s more of a soft cooler. I know, it looks like Caterpillar isn’t offering much variety with either the sizes or the colors. With the colors, however, I personally wouldn’t want my Cat cooler to be any other color. It wouldn’t feel like a Caterpillar cooler anymore. As for the sizes, the two available seem to cater to the needs of a workman perfectly fine in my opinion. The company that manufactures Cat coolers offers a limited lifetime warranty on the Cat cooler and a 60-day money back guarantee. I don’t know about you but that sounds like a sweet deal to me. This is one of those coolers you use for a very specific situation. 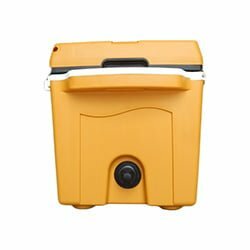 If you need a cooler that will be your close companion at work and one that can easily withstand harsh work conditions, then this is the right cooler for you. 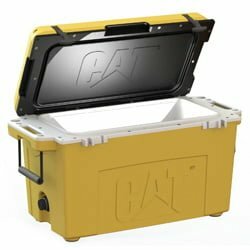 One of the unique things about Cat coolers is that they aren’t manufactured or delivered by Caterpillar. We think it’s the first time we’re reviewing a cooler like this. 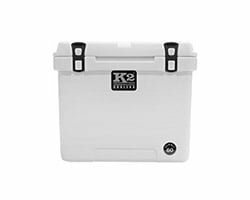 The coolers are manufactured by Taiga, a USA manufacturer that is owned by veterans. The arrangement is a drop shipping one, where Caterpillar markets and sells the coolers, then passes the purchase orders on to Taiga, who make the deliveries. We’re very proud of Caterpillar for supporting local labor like this, especially considering the company is owned by veterans. It says a lot about the company’s sense of patriotism. 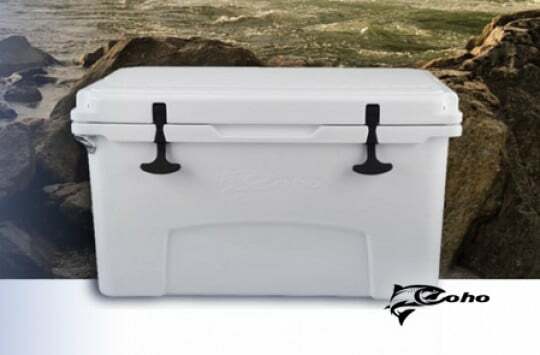 Plus, we reviewed Taiga’s very own coolers last year and needless to say, their ice chests were super-solid quality. It seems to us that Caterpillar has spent quite some effort when choosing the manufacturer for their upcoming ice chests. They could have gone the easy route: stick their logo on some low-end, cheap-to-make cooler and then sell it for a premium price. Instead, it looks they’ve invested into making sure their manufacturing partner can deliver the best possible product – and Taiga definitely did great job here. Right off the bat, it probably seems like Yeti is the obvious winner in this comparison. They offer more variety in terms of size and color, their coolers are more readily customizable, has better ice retention, and have a tonne more of features (details here). But let’s take a step back for a moment and look at some of the things Cat does well. For starters, the body of the Cat cooler seems stronger than the Yeti’s, perhaps due to the fact that it’s made from polypropylene. It’s also built for environments that Yeti might not have been designed to operate in. Sure, Yeti is certified bear resistant and has passed more drop tests than anyone can count, but has anyone tested how a Yeti would hold up at a construction site? Meanwhile, Cat coolers clearly were built specifically for this. If we’re going to make a comparison based purely on fitness for purpose, then the Cat is a strong leader. Besides, the Cat blows the Yeti out of the water when it comes to price. 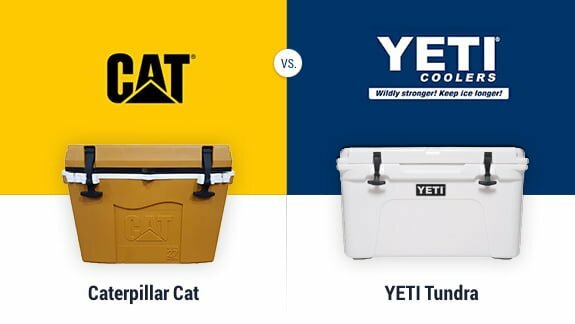 The Yeti Tundra 35, which is the closest comparison to the 27 quart Cat cooler, is way more expensive. If you’re looking for a more general cooler, or are a die-hard Yeti fan, then you should get yourself a Yeti – it’s a fantastic cooler by all means. 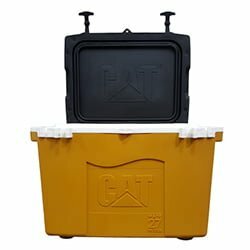 Meanwhile, if you typically work in harsh environments such as construction sites, and want something specifically built for that environment, then you can’t go wrong with a Cat cooler. Cat Coolers for Sale – Where To Buy Them? 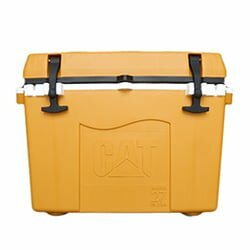 You can buy Cat coolers on the Caterpillar product website or on Amazon, which in our opinion is the safest and one of the most reliable places to get coolers online. As a buyer on Amazon, you enjoy numerous benefits that you would not get elsewhere. You get to read real reviews from other customers who have purchased the product before you and this helps you better make your purchasing decision. Returning product in case you don’t like it is also super easy on Amazon. And, if you’re a Prime member, you could even enjoy free shipping. Cat has made a special cooler for special people. As far as specializations go, we think this cooler has nailed it. We’re just looking forward to more variety in terms of sizes and colors in the future (for our readers’ sake, though, because I am totally digging the yellow).